These frescoes refer to Francis's journey to Egypt to convert the Muslims there. Although he didn't achieve this, it seems he was welcomed by the Sultan who enjoyed the debate between Francis and the Muslim scholars. The probably apocryphal story of the ordeal by fire comes down in a number of versions. The idea was that Francis and a Muslim scholar should undergo the ordeal; God would save the representative of the true religion. It is not clear who came up with the idea. In the end, though, it seems it didn't happen. 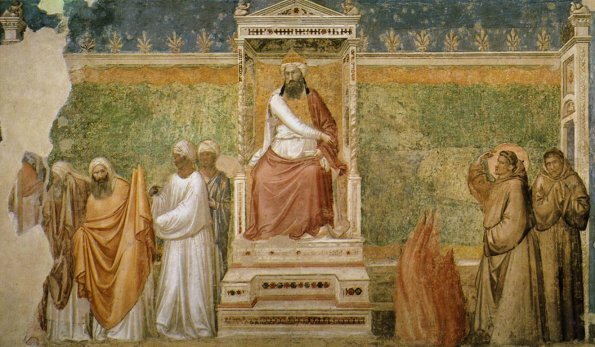 In the Bardi image the Sultan appears to be pointing at the fire and looking at the scholars, who don't look at all keen on the idea. Facial expressions are rather less clear in the Assisi version. It seems an odd idea to focus on a mission that clearly did not succeed, but the story illustrates an important aspect of Franciscanism: missionary work, that provided them with mainstream rather than heretical credentials. On our visit to sites in the Holy Land in 2016, we were surprised to discover that many of them were cared for by Franciscans - they are still there. Perhaps we shouldn't have been surprised. This legend is taken from Bonaventure's Life of St Francis. 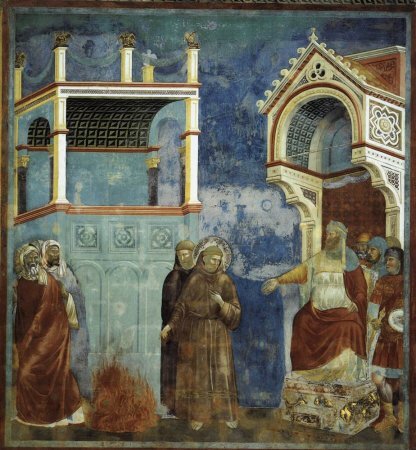 St Anthony of Padua is preaching a sermon to Franciscan brothers when an apparition of St Francis appears in the room. (This is while Francis was still alive, not long before the stigmatization.) 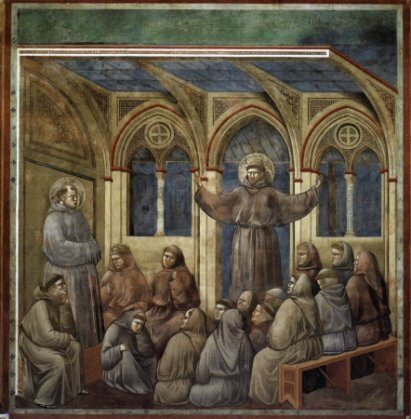 In the Assisi fresco the brothers are concentrating on the words of St Anthony, but one friar, named by Bonaventure as Monaldus, sees the vision of Francis. 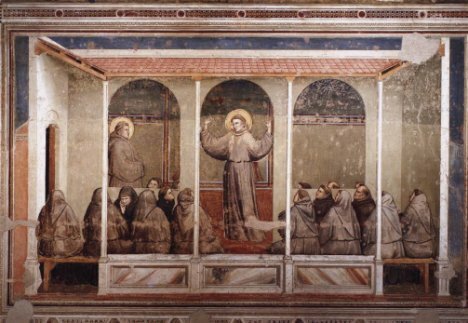 In the Bardi chapel Giotto slightly changes the story: here a number of the friars are gazing at Francis. The posture of Francis, with arms stretched out in the form of the crucified Christ, may well be a precursor to the stigmatization to come.